North Carolina political leaders say they’re helpless to remove confederate statues. They’re wrong. Protesters outside the Durham County courthouse remove a Confederate statue from its base. 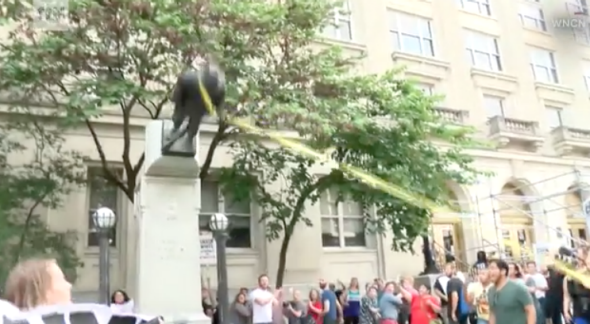 On Monday evening, 22-year-old Taqiyah Thompson climbed a ladder in front of a North Carolina courthouse and looped a length of webbing around the torso of a likeness of a Confederate soldier. Once she came down, protesters pulled the rope, easily toppling the statue from its base. Its head gave way and flattened into its neck as soon as it hit the ground, a poetic coda to a rich symbolic victory. Thompson’s action came two days after hundreds of white supremacists descended on Charlottesville, Virginia to protest the removal of monuments to Confederate generals. In response to violence against counterprotesters that ended in one death and 19 people injured, the president applauded the racist mobs for having a permit and called some of them “very fine people.” Monuments lionizing leaders of the Confederate States of America, Donald Trump intimated, are as valid as those erected to honor George Washington. Durham County law enforcement defended those monuments yesterday, when officers arrested 22-year-old Thompson after she gave a late-afternoon press conference. Thompson faces two felony charges—inciting and participating in a riot with property damage over $1,500—and two misdemeanors. On Wednesday, the Durham County Sheriff’s Office arrested Dante Strobino, Ngoc Loan Tran and Peter Gilbert, and hit them with the same charges. Thompson defended their actions in her address at the Tuesday press conference. “Everyone who was there, the people did the right thing,” she said. “The people will continue to keep making the right choices until every Confederate statue is gone, until white supremacy is gone. That statue is where it belongs. It needs to be in the garbage.” Tran called for immunity for the protesters, condemning a statement made by Gov. Roy Cooper, a Democrat, who said that demonstrators should have waited for government entities to remove the statue—a route toward which Cooper has taken some small steps—instead of pulling it down. But any state-sanctioned action against Confederate monuments will be a long time coming, if it comes at all. Just two summers ago, the North Carolina legislature, with then–Gov. Pat McCrory’s vocal support, passed a law specifically designed to protect statues and plaques that fetishize the militia that fought to preserve slavery. The law prevents any local governments from taking action to move or remove public “objects of remembrance” without an act approved by the heavily Republican, veto-immune General Assembly. Cooper has called for the repeal of this law, expressed support for continued removal of Confederate statues, and directed a state agency to figure out how much it would cost to move the monuments on state property to museums or historical sites. Without the legislature’s backing, these well-meaning nods to decency mean next to nothing. That doesn’t mean Cooper or town officials are powerless in the face of this law, as they have suggested they are. For a town to face consequences for removing a Confederate monument, someone would have to sue it. That someone would most likely be Josh Stein, North Carolina’s Democratic attorney general. With enough pressure from the public and the support of the governor, who wrote in a Tuesday Medium post that “we cannot continue to glorify a war against the United States of America fought in the defense of slavery,” Stein could choose to let a principled municipal government tear down its monuments to the Confederacy with no repercussions. If leaders of liberal cities like Durham really wanted to take a stand against white supremacy, they could destroy their Confederate statues and dare the state to take them to court over it. They could appeal the verdict as high as the courts would let them, because if landing a blow against the trappings of white supremacy isn’t worth a court fight, what is? At Tuesday’s press conference, the leaders of the Durham protest challenged their representatives in state and local government to put their ropes and wrecking balls where their mouths are. “We are tired of waiting on politicians who could have voted to remove the white supremacist statues years ago, but they failed to act. So we acted,” Thompson said. Tran expressed doubt that any official action would ever come: “We know that the only thing that’s going to take down these Confederate monuments, as we saw in Durham last night, is organized people’s power.” Government officials are rarely willing to engage in civil disobedience, even for the most righteous causes. Where they have failed time and again to reject unjust laws and symbols of oppression, civil rights activists have stepped in. In today’s civil rights movement, black women are some of the boldest and most visible leaders. A video from Monday evening’s protest shows Thompson standing atop a monument dedicated “to the boys who wore the gray” in a war against black humanity, waving her arms as a crowd cheered. Her movements echoed the actions of Bree Newsome, who scaled a flagpole outside the South Carolina Capitol building in 2015 to take down its Confederate flag. This week, Newsome has been speaking with and tweeting in support of Thompson, responding with unwarranted patience to Twitter users who invoked Martin Luther King Jr.’s name in defense of the cops who arrested the Durham protesters. “Pulling down monument 2 racism while harming no one is nonviolent direct action,” she informed one person who claimed the demonstrator “tarnishes” the cause. “Does Boston Tea Party tarnish the American Revolution?” Neither tea nor statues can feel, bleed, or lose their livelihoods and voting rights after a felony conviction. Nonviolent protesters on the right side of history can.